Multi-hand 3 card poker game is one of the newer casino card games. Created in 1994, and hugely popular in the United Kingdom. 3 card poker is one of the newer casino card games to surface in the last two decades. Created in 1994, and hugely popular in the United Kingdom when it came out, the game has many names and variations, and is now one of the more popular poker card games readily available in online casinos across the internet. The rules of multi-hand 3 card poker generally aren't any different from that of other standard " card poker online poker games, and like most simple online card games, it is mostly played between you and the dealer. Although in some online casinos, you may have the option to play against other human players. 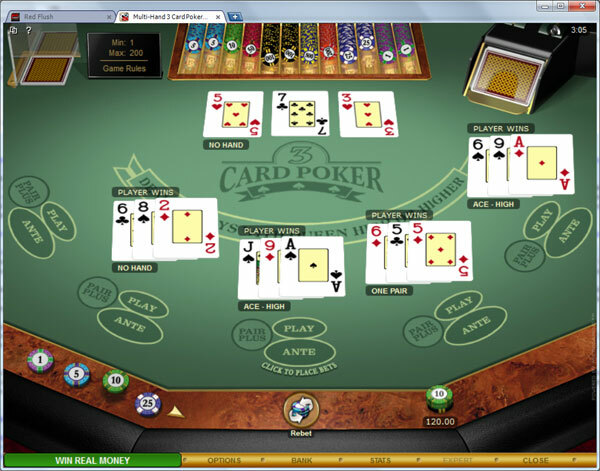 The game itself, being a variant of the original three card poker incorporates the same playing system. To begin, a bet must be made by the player, and there are two places to do so. The ante bet spot, and the pairs plus bet spot. The ante spot is where your standard bet is to be placed, this bet is only to receive the three cards, so think of it as a kind of playing fee. If you choose to bet on the pairs plus spot, you'll need to pick up a pair in your hand, or you'll lose your pairs plus bet. The player is then dealt three cards. Once you have received your three cards, you must decide whether to play or fold. If you fold you will lose your ante bet. Should you choose to play, you'll need to put a wager down in the location marked as "play". For the dealer to win, they must have a Queen high or better, if the dealer fails to achieve such a hand, then you'll pick up your ante bet, regardless of what cards you hold, along with your play bet. If their hand does qualify, then both of your bets are now in play. Obviously, the player with the better hand, wins. The catch in multi-hand poker, is that you may play more than one hand. Each online casino, or variant of multi-hand poker has different limits on the amount of hands you can have, but keep in mind you'll need to place bets for each of those hands you decide to play. The advantage of having multiple hands is that it allows you to see more of the deck, which should, if you have even the most limited amount of poker knowledge, give you insight into what the dealer may or may not have in his hand. There are many variants of multi-hand 3 card poker, including the original 3 card poker itself. 3 card poker is essentially exactly the same game, though allowing you only one hand to play with. This however, does not mean that the game offers you any less likelihood of winning, if you are skilled. Multi-hand, standard 3 card, and three card rummy are all variants of the same game that are available in most online casinos, wherever a good mix of card games are offered. Most online poker sites also have any number of game variants on offer too.